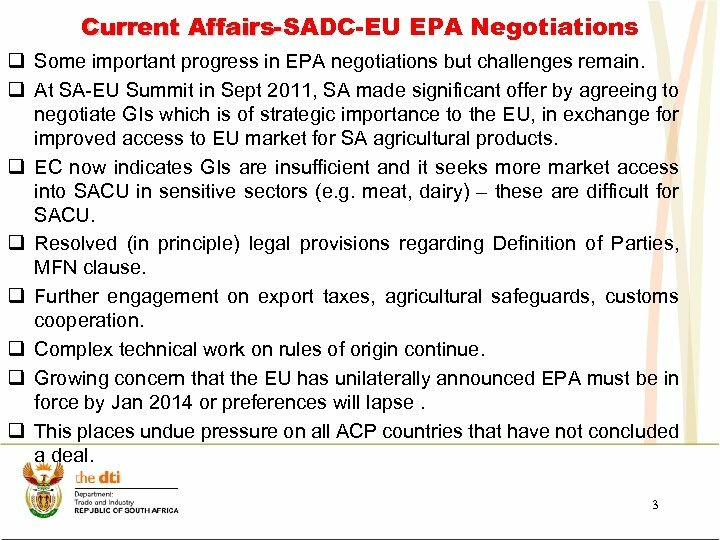 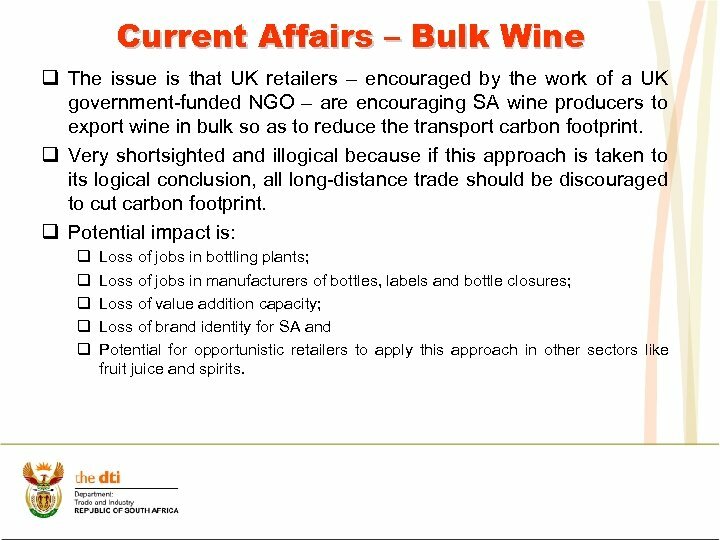 Current Affairs – Bulk Wine q The issue is that UK retailers – encouraged by the work of a UK government-funded NGO – are encouraging SA wine producers to export wine in bulk so as to reduce the transport carbon footprint. 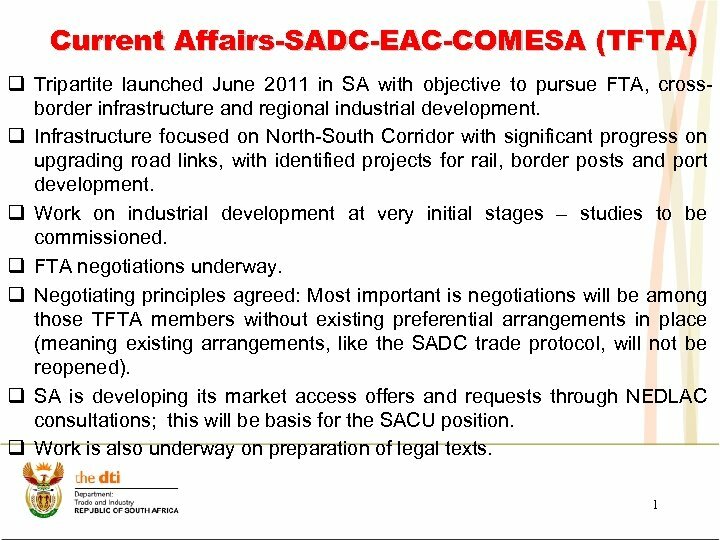 q Very shortsighted and illogical because if this approach is taken to its logical conclusion, all long-distance trade should be discouraged to cut carbon footprint. 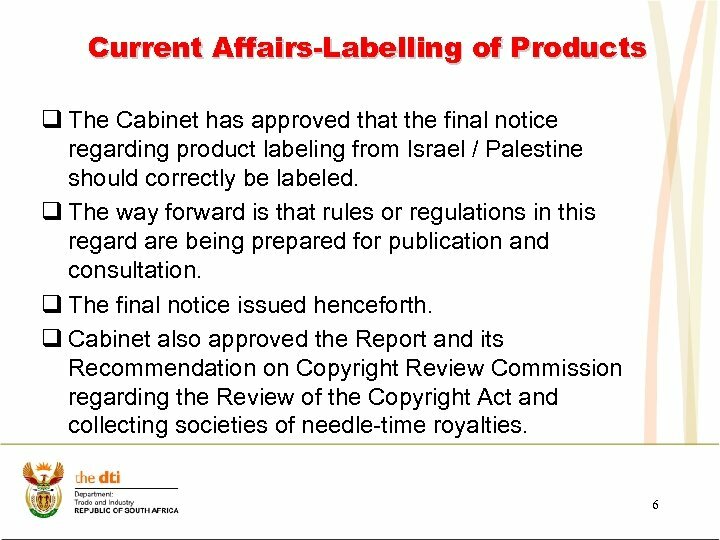 q Potential impact is: q q q Loss of jobs in bottling plants; Loss of jobs in manufacturers of bottles, labels and bottle closures; Loss of value addition capacity; Loss of brand identity for SA and Potential for opportunistic retailers to apply this approach in other sectors like fruit juice and spirits. 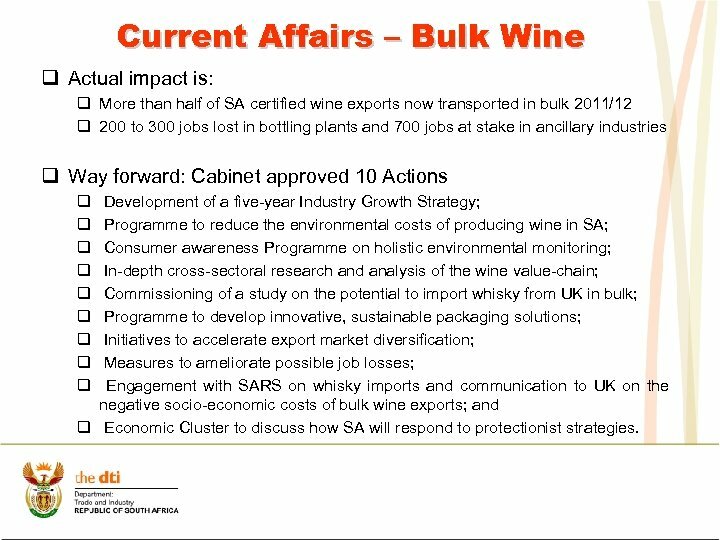 Current Affairs – Bulk Wine q Actual impact is: q More than half of SA certified wine exports now transported in bulk 2011/12 q 200 to 300 jobs lost in bottling plants and 700 jobs at stake in ancillary industries q Way forward: Cabinet approved 10 Actions q q q q q Development of a five-year Industry Growth Strategy; Programme to reduce the environmental costs of producing wine in SA; Consumer awareness Programme on holistic environmental monitoring; In-depth cross-sectoral research and analysis of the wine value-chain; Commissioning of a study on the potential to import whisky from UK in bulk; Programme to develop innovative, sustainable packaging solutions; Initiatives to accelerate export market diversification; Measures to ameliorate possible job losses; Engagement with SARS on whisky imports and communication to UK on the negative socio-economic costs of bulk wine exports; and q Economic Cluster to discuss how SA will respond to protectionist strategies.